Global sales of UK food and drink have reached a record high in the first half of 2018, with the US, China and Hong Kong among the top importers of British produce. UK food and drink businesses are selling produce into more than 200 global markets, with new meat export markets boosting sales of barbecue meats, with the weaker pound since the vote to leave the EU also helping British exporters. Whisky remained the top export product, with £2bn worth of sales. Sausages have risen by 48 per cent with cuts of beef up 117 per cent – and a further boost expected to come from the Chinese lifting their BSE ban on British beef and Taiwan importing UK pork for the first time. Farming Minister George Eustice said consumers across the globe saw British produce as ‘delicious’ and high in quality, with high standards of animal welfare. He said: “This is why we are continuing to see a huge growth in the worldwide demand for the best of what British farmers and food producers have to offer. Seasonal goods such as ice cream and strawberries were also in demand, with Somerset-based Granny Gothards now exporting to Bahrain, Abu Dhabi and Dubai selling iconic British-inspired flavours such as clotted cream and whisky and marmalade. Founder Amanda Stansfield said: “After the success of our ice creams in Dubai, it seems an ideal time to now establish our brand in China." She added seeking advice was ‘key’ for those looking to export, with Government trade experts providing guidance to businesses entering overseas markets. 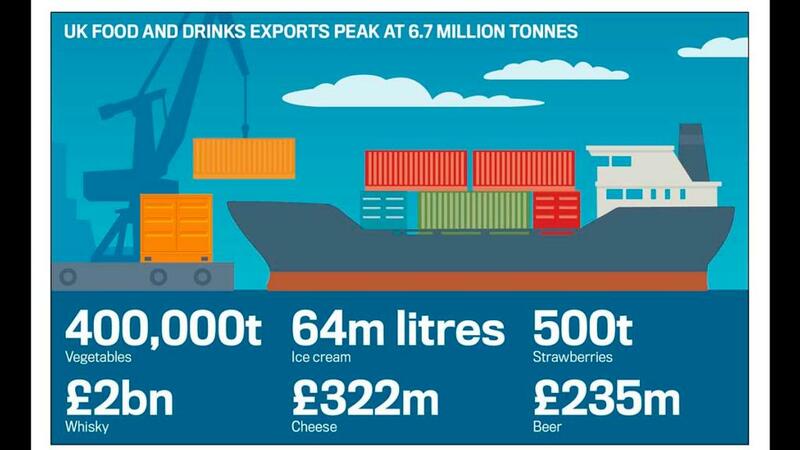 WITH an ambition to grow exports of value-added food and non-alcoholic drinks by a third by 2020, the Food and Drink Federation (FDF) believes there has never been a better time to begin exporting. Department for International Trade figures showed exporters saw a 34 per cent increase in productivity within their first year of exporting. The first steps were researching whether the business would benefit and whether the business has the resources, researching trends and target markets and creating a simple export plan. Then businesses needed to decide where to target by looking at where there was a trend for the product, and expected growth markets. They also advised businesses not to quote prices until all additional costs, such as packaging and transportation, were known. Making the company visible by updating websites and social media, visiting the market and exhibiting at trade fairs could help develop relationships with potential customers and it was important to keep in contact with customers and develop relationships. Businesses also needed to understand the practicalities of exports including health certificates and liability insurance.